As people age, they begin to deal with a number of difficult issues. Whether it’s failing health, having friends and family pass away, or leaving their homes for assisted-living facilities, there’s no doubt these things have adverse effects on their lives. Although many of these events are inevitable, feeling good and enjoying life doesn’t have to end when your hair turns white and your mobility slows down. Did you know that the simple act of owning (or just being around) pets can have a positive impact on numerous aspects of your life? From helping seniors be physically and mentally healthier to providing companionship that helps to lessen feelings of depression and loneliness, pets can work wonders in improving the lives of seniors. For many seniors, getting a good night’s sleep can become difficult to obtain. Physical pain, depression, and anxiety can often lead to many restless nights. However, studies have shown pets can be helpful when it comes to obtaining more sleep. Research suggests that cat owners are twice as likely to have a better sleep with their kitties on their beds than to be bothered by them. So perhaps it’s time that you let Fluffy put her head down next to you, and see if you’re one of the many who could get a better sleep with your pet close by. With many seniors dealing with heart health issues, their days are often filled with taking medication and often being unable to participate in activities they once enjoyed. But yet again, pets can come to the rescue. Whether seniors have a pet of their own or are around therapy animals brought to a nursing home or other senior living area, the good news is that these animals can lead to amazing results concerning heart health. According to researchers, cat owners are 30 percent less likely to die from heart attacks or strokes than those who do not own cats. In addition to this, they will also experience lower levels of cholesterol and triglycerides, and see their blood pressure greatly reduced. Due to their many physical struggles, isolation, and feelings of depression, it’s only natural that many seniors find themselves feeling stressed out and anxious about what lies ahead. However, pets can again greatly impact this part of life. By owning or simply petting animals, studies have shown that levels of the stress hormone cortisol are significantly reduced, leading to much calmer days. As we age, one of the misfortunes we may encounter is having an occasional stay in a hospital. Whether it’s to treat a broken bone or have surgery, there’s no doubt it can be a stressful time, especially for seniors. Yet, this is another area of life where our pets can help us feel much better. In recent studies, patients who were hospitalized for various ailments were found to have decreased levels of pain, less respiratory distress, and greatly improved moods when their pets or therapy animals were able to visit them. It was also noted the energy levels of patients improved, while stress and anxiety lessened. With exercise being shown over and over as a key to good senior health, it’s extremely important for seniors to get up and get moving as much as possible. Unfortunately, for those who live alone or have physical issues, the motivation to do so may simply not exist. Yet, if there’s a pet in the room, chances are they will get their human up and moving in a matter of minutes. Whether tossing a ball around a room, filling up their feeder and water for the day, or just getting out of a chair to see what their kitty is staring at outside a window, seniors who exercise with their pets for as little as 15 minutes per day have been shown to feel much better physically and mentally. For seniors who may not have a large social network of friends or family, a pet can become not only a great source of comfort, but also a confidant. If there is one thing our animals are great at doing, it’s listening to our problems without being judgmental or critical. Because of this, seniors often feel less anxious when they talk about their problems with their pet. By doing so, they can not only get problems off their chest, but do so in a way that will let them feel safe and secure, and that has been shown to reduce loneliness and increase feelings of companionship. Many seniors deal with issues that require physical therapy, and studies have shown having pets assist in the process can pay big dividends. In physical therapy programs where patients were recovering from joint replacement surgery, researchers noted patients had less pain, communicated better with their therapists, and were in a better mood during therapy sessions when a therapy animal was part of their recovery program. When seniors start to experience loneliness due to the loss of loved ones or due to physical issues that limit their ability to go out and socialize, having a pet around can lead to expanded social networks. Whether it’s giving them the courage to open that Facebook account they always wanted to have or make new friends by joining a book club at the local library, pets are great at bringing like-minded people together. As any pet owner knows, all it takes is striking up a conversation with a fellow pet owner, and before you know it a new friendship has been established. In today’s world, it can be harder than ever at times to feel safe and secure. However, for seniors who have pets as part of their lives, that task can be made much easier. 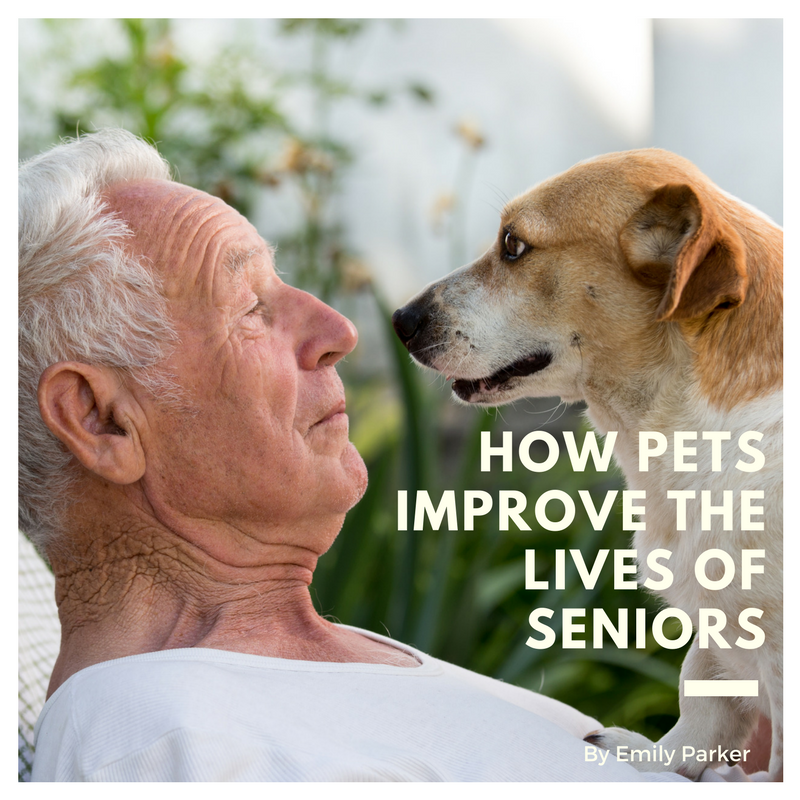 Whether helping their humans through a tough physical therapy session, lowering their blood pressure by sitting in their lap and purring, or just lending a sympathetic ear to listen to their owner’s concerns, it’s clear pets can indeed greatly improve the lives of seniors.